Robert and Dorothy Webb, photographed at UCLA Samueli, during a celebration of their latest gift. 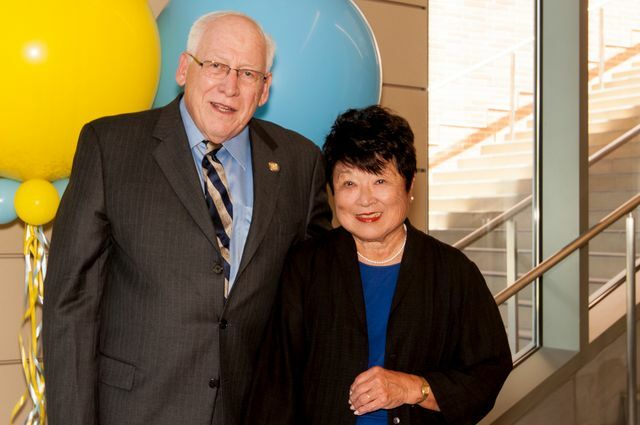 The UCLA Samueli School of Engineering has received $3 million from Robert and Dorothy Webb. Of the total, $2.5 million names the Robert and Dorothy Webb Lobby in the new Engineering VI building. The balance establishes the Dr. Robert M. Webb and Mrs. Dorothy Webb Endowed Fellowship, which will be open to graduate students in any engineering field. The funds will support UCLA Samueli’s effort, already underway, to expand by 1,000 students and 50 faculty members. Both contributions honor the couple’s own campus experience: They met in a coffee room in Engineering Unit 2, now known as Boelter Hall; their first date was at a UCLA basketball game. They were married two years later. Robert Webb worked as a nuclear engineer at TRW, a manufacturer of space and defense technology and information systems. (TRW was acquired by Northrop Grumman in 2002.) His projects included the Mars NERVA program and the Pioneer 10 spacecraft, the first man-made object to leave the solar system. He continues to consult in aerospace after nearly 60 years in the field. Dorothy Webb earned her bachelor’s degree in Spanish from UCLA and a master’s in library science from the University of Southern California. She worked as a technical librarian at Hughes Aircraft for more than 20 years and then as a foreign language librarian for Los Angeles County. The Webbs’ giving to UCLA spans 45 years and multiple programs and units. In particular, they support a range of teams as loyal UCLA Athletics donors and fans. The couple meet with student-athletes and coaches, and even travel with teams. 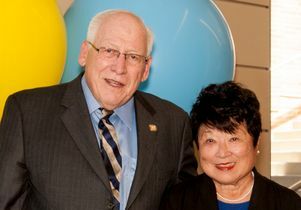 The couple’s latest gifts to UCLA Samueli are part of the $4.2 billion UCLA Centennial Campaign, which is scheduled to conclude in December 2019 during UCLA’s 100th anniversary year. As planned gifts, the contributions also advance the UCLA Bequest Challenge, which aims to secure 1,200 new commitments to include UCLA in wills or living trusts during the campaign.